In Chinese boxing the contrast between external and internal styles is very well defined. This distinction, however, is somewhat muddled in Okinawan karate.2 "The manner of spitting or drinking is either hard or soft" is taken from the Isshinryu Code (Eight Precepts of the Fist) but few ponder its meaning. In Japanese bujutsu the expression Ju yoku go o sei suru translates as "Softness controls hardness" or "Weakness controls strength. "3 This is a philosophy that was probably hijacked from Chinese Daoism. 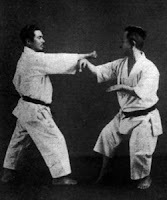 Certainly, proper technique will win over brute strength, as again, this idea is held consistent within all combative styles. Taking the hard-soft dichotomy to the next level of psychology or philosophy we could define these terms along different parameters. For example, an external or hard approach to martial arts could be found in the desire to compete in tournaments, training with ishi sashi (traditional weights) or on the makiwara (striking post). Soft or internal approaches may be realized in preventive measures such as verbal deescalation, awareness of one's surroundings, and cultivating health and chi through the practice of forms and meditation. In Daoist texts the soft or yin model is commonly expressed as water. Water, the softest of all things, can eventually erode even the hardest of objects while seeking its own level and being at one with nature. As Bruce Lee famously said, "Water flows -- or it can crash! Be water, my friend." 1. Daniele Bolelli 2003. On The Warrior's Path. Frog, Ltd.
2. Michael Rosenbaum 2001. Okinawa's Complete Karate System: Isshinryu. YMMA Publication Center. 3. Donn Draeger 1974. Modern Bujutsu & Budo. Weatherhill, Inc.